The next recipe in the Cookies, Bars & Biscotti section of the Modern Baker Challenge is a classic French cookie with a bit of classic French fussiness to it. In case you’re wondering, tuile is pronounced “tweel” (rhymes with “feel”). Or in my case, rhymes with “fail”. I love my Roul’Pat for so many things. Nothing sticks to it. It’s reusable and prevents wasting parchment paper. It keeps pans clean and wipes right off. 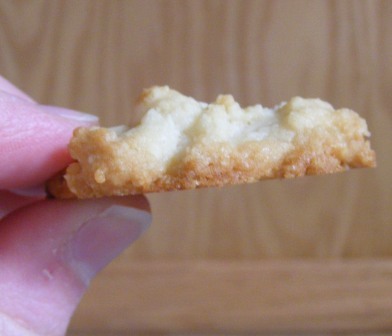 Unfortunately, it also keeps tuiles from spreading when they bake. 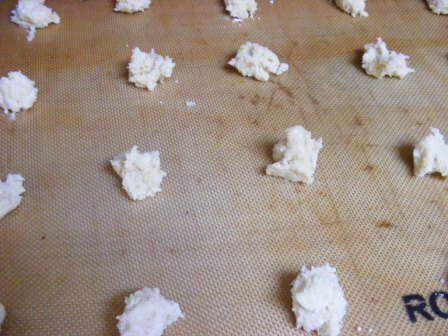 The tuiles are supposed to spread paper-thin in the oven. Then when you take them out, you drape them over a cylindrical form so they take on a Pringle-like shape. As you can see, my tuiles didn’t spread. At all. So, what did I do with this colossal tuile failure? I told my family they were lemon almond cookies. And they loved them. 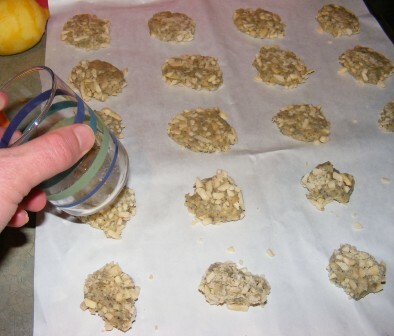 I might try these again someday, this time on buttered parchment instead of Roul’Pat. Although to be honest, the thought of shaping all those cookies when they come of the oven doesn’t thrill me. And my family was right — they tasted fine the way they were. Come on. You know you want one of these babies. 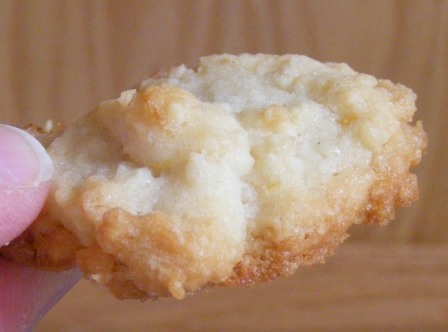 This is the next recipe in the Cookies, Bars, & Biscotti section of the Modern Baker Challenge. 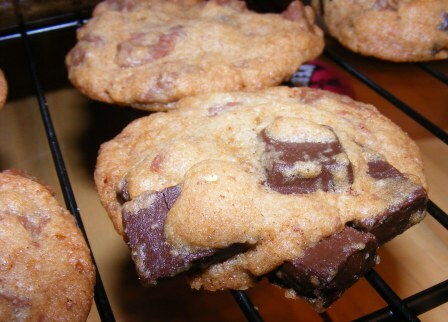 I’ve bake these cookies twice already, in part because they’re so good. But also because I didn’t get any pictures the first time I made them. I went on a baking tear right before Thanksgiving, as we had lots of family coming into town. Unfortunately, I was so focused on baking that I didn’t get pictures of a lot of the stuff I made. 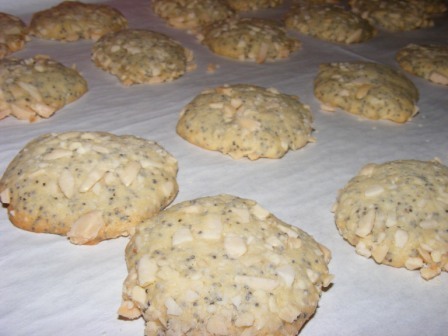 I went ahead and posted some of the recipes without pictures, but these were such good cookies, I used the lack of photos as an excuse to make them again. Although butterscotch is the first word in the name of these cookies, they don’t have any kind of butterscotch chips or other flavoring in them. The flavor comes from the combination of ingredients, chiefly the brown sugar. 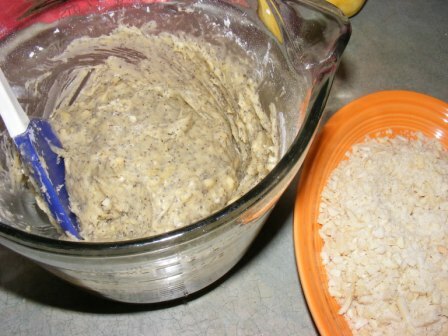 The dough also called for flour, baking soda, salt, butter, egg, and vanilla. Oh, and chocolate. Lots and lots of chocolate. Bittersweet and milk chocolate chunks get folded into the batter after it is mixed. Both times I made these, I was surprised by how much chocolate there is compared to the rest of the batter. 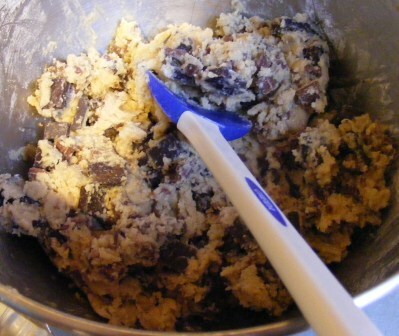 The addition of the chocolate chunks almost doubles the volume of the dough. Not that I’m complaining, mind you. Having just enough cookie dough to hold together the chocolate is just fine with me. 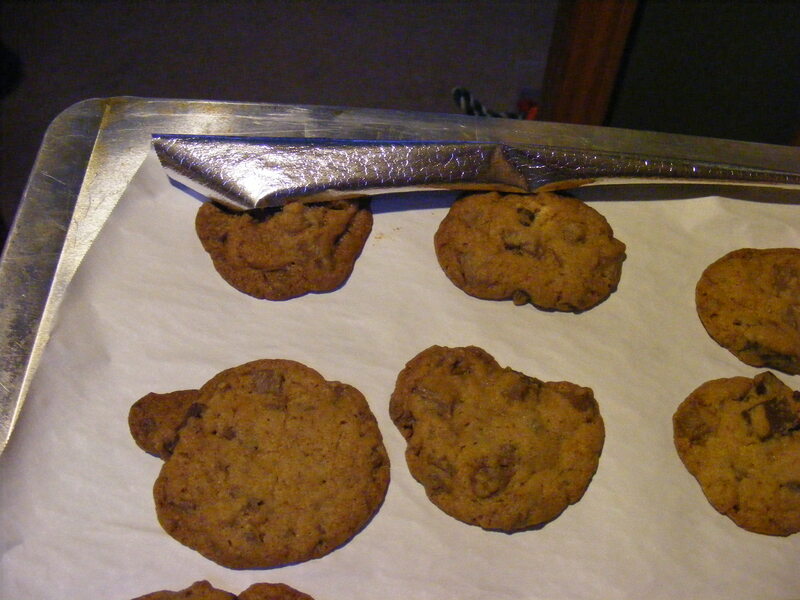 After mixing the dough, I dropped the cookies onto a cookie sheet lined with parchment foil. I put the cookies in the oven, realized I had forgotten to take a picture of the dough on the pan, and took a quick shot of the cookies in the oven. I baked the cookies for about 15 minutes at 350°F, per the recipe, although I think they should have come out a few minutes earlier. They didn’t burn, but they were crispier than we like them. 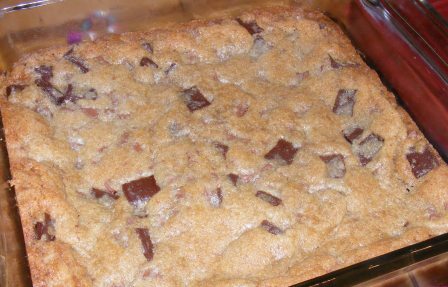 While the first batch of cookies was baking, M asked if we could make cookie bars with the rest of the dough, so she pressed the remaining dough into an 8×8 pan. We baked the bars for about 25 minutes, until the edges were starting to brown, but the center still looked nice and doughy. Unlike the cookies, the bars were baked perfectly. 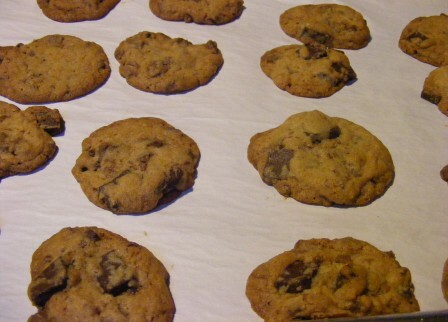 These are really delicious cookies, with a definite butterscotch flavor. And, of course, a rich, gooey, abundance of chocolate. Even though the cookies were a bit on the crispy side, they were great for dunking in milk. And the bars were soft, crumbly perfection. 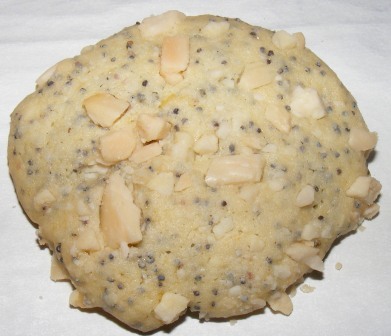 Renee was the official blogger for this recipe for the Modern Baker Challenge. Check out her blog to see what she thought of them. And if you’d like to join the Challenge, you can jump in any time. With Fat Tuesday just around the corner, I thought I’d try something new this year in addition to my traditional King Cake. I had the idea to make something with the traditional Mardi Gras colors of gold, green, and purple, and I wanted it to resemble beads. And then it hit me: caramel corn! It’s sweet and decadent, perfect for Fat Tuesday. 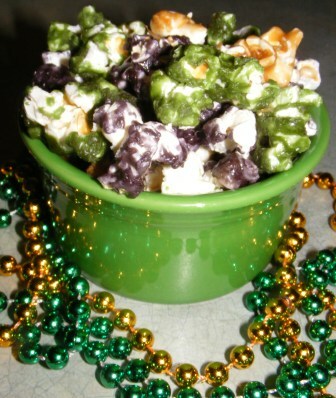 And with a few drops of food coloring, the caramel turns the popcorn into little sweet salty bead-like nuggets of love. I searched the ‘net for a caramel corn recipe to use as a base, and ended up taking ingredients, amounts, and techniques from several recipes, which I combined to come up with my own version. 2 regular sized bags of microwave popcorn make just the right amount of popcorn. You could also use about 6 quarts of popped regular popcorn. Keeping the popcorn warm before adding the caramel will keep the caramel from seizing up and will make it easier to mix. If you want more uniformly coated caramel corn, put the popcorn in bowls before adding the caramel. This will allow you to mix it more thoroughly (but will also result in three unnecessary dirty dishes). Using roasting pans or other pans with high sides will also make it easier to stir the caramel corn. The caramel has to be used as soon as it’s ready, or it will start to cool and harden, so mise en place it key to this recipe. Having all of your ingredients and equipment set out and at hand will enable you to manage making three separate batches of caramel corn all at once. If you want to make an insanely large batch of caramel corn for a party or to give away, you could make three separate batches, one of each color. In that case, you could bake each batch of caramel corn on two pans. Spraying the measuring cup before measuring the corn syrup will make the sticky syrup slide right out of the cup. I like the mixture of light and dark brown sugars, as it gives the caramel corn a nice color and depth of flavor; but you could use 2 cups of either. When adding the food coloring, remember — less is more. Start with just a few drops and mix it in well before adding more. You can always add more food coloring, but you can’t take it out. I used a bit too much in my purple batch, as the caramel was a deep golden color, and I thought it would take quite a bit to color it. It really doesn’t take much at all. If you like nuts in your caramel corn, add 2 cups peanuts, pecans, or mixed nuts to the popcorn in the pans before adding the caramel. Run the saucepans and spoons under hot water as soon as you’re finished with them. The caramel will scrape off easily. Arrange racks in upper and lower thirds of oven and preheat oven to 200°F. Line three roasting or jellyroll pans with foil and grease with cooking spray. 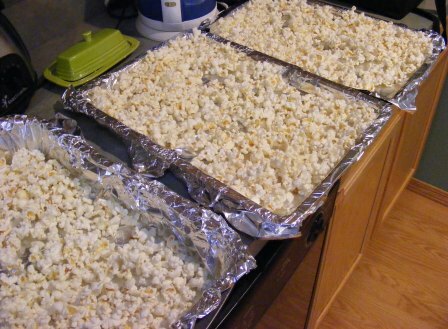 Pop popcorn and divide evenly among the three pans. Place pans in oven to keep popcorn warm. Measure vanilla and baking soda into small prep bowls and set near stove. Fill small saucepan with hot water and set aside. 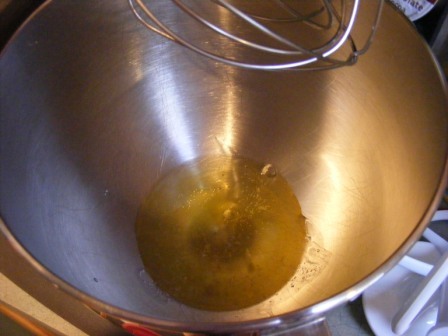 Place butter, brown sugars, corn syrup, and salt in large saucepan. Cook over medium heat, stirring frequently, until butter and sugars melt and mixture comes to a boil. As soon as it boils, stop stirring and set a timer for 4 minutes. While the caramel is cooking, empty and dry the small saucepan, setting on the stovetop to stay warm, and take one pan of popcorn out of the oven. When the timer goes off, remove the saucepan from heat and stir in vanilla and baking soda. The mixture will foam up a bit at first. Pour 1/3 of the caramel over the first pan of popcorn and immediately return the pan to the oven (don’t stir the popcorn). 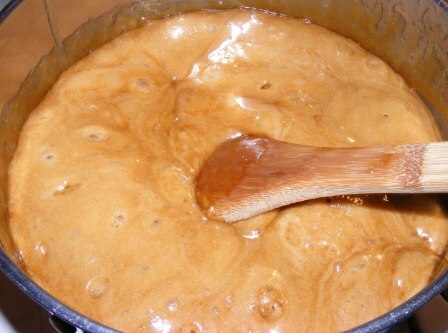 Pour another 1/3 of the caramel into the small sauce pan. Set the large saucepan aside. Add a few drops of purple food coloring to the caramel in the small pan and mix well, adding more food coloring if necessary to get the desired color. 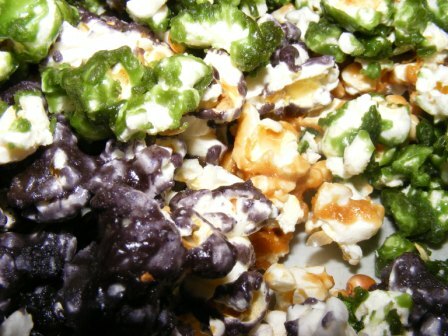 Remove a second pan of popcorn from the oven, pour the purple caramel over the popcorn, and return the pan immediately to the oven (don’t stir the popcorn). Add a few drops of green food coloring to the caramel in the large pan and mix well with a clean spoon, adding more food coloring if necessary to get the desired color. 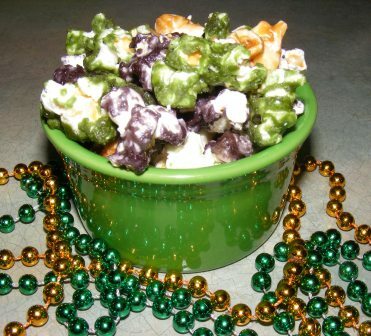 Remove the third pan of popcorn from the oven, pour the green caramel over the popcorn, and stir the popcorn to coat with caramel. Return the pan to the oven, then take the other pans out one at a time and mix well, using a different spoon for each pan. Bake the caramel corn for 60 minutes, taking the pans out to stir well every 15 minutes. Dump the caramel corn out onto waxed paper and use a wooden spoon to break up any big chunks. Allow to cool, then mix all three colors together and store in an airtight container. Me: I don’t like meringues. It’s like eating air. Nancy: It’s like eating sugared air. And what’s wrong with that? OK, so maybe Nancy does have a point. But I’ve still never been a big fan of meringues. However, I knew if anyone could change my mind, it would be Nick Malgieri. Besides, these meringues were up next in the Modern Baker Challenge, so I was going to make them, like it or not. 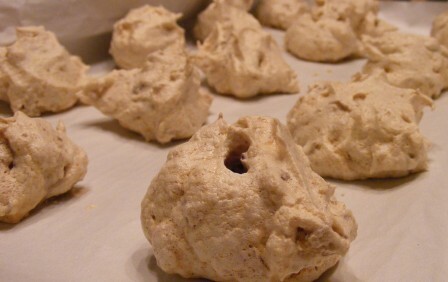 Most meringues I’ve tried in the past seemed to be nothing more than egg whites and sugar, so I was intrigued by the addition of chocolate, espresso powder, and walnuts to this recipe. And the variation with walnuts and cinnamon sounded interesting, too. Given my overall skepticism, I decided to make a full batch of meringues, but divide the meringue in half so I could make a smaller batch of each kind to try. I began by whipping egg whites and salt in the mixer. I added half the sugar, a little at a time, while the egg whites were whipping. 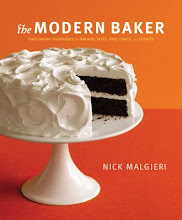 By the way, if you happen to have the hardback edition of The Modern Baker and are wondering what you’re supposed to do with the remaining sugar, the answer can be found in the paperback edition of the book. The rest of the sugar gets layered in with the remaining ingredients below. 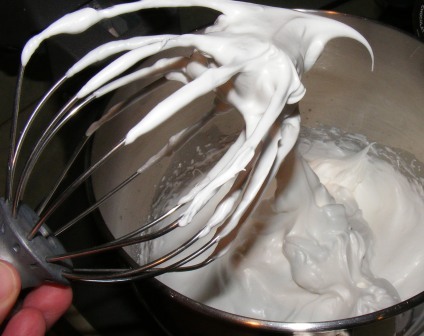 Once the egg whites had reached meringue consistency, I removed the bowl from the mixer and divided the meringue between two bowls. 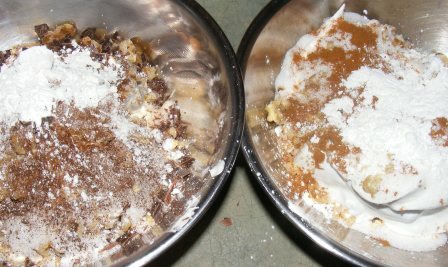 The bowl on the left contains walnuts, the rest of the sugar, espresso powder, bittersweet chocolate, and cornstarch. 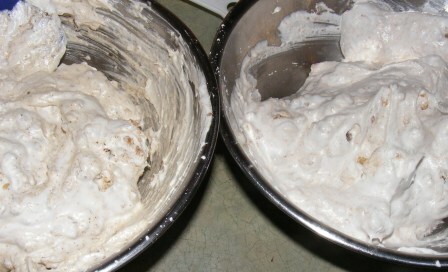 The bowl on the right has walnuts, sugar, cinnamon, and cornstarch. I folded the ingredients in gently, trying not the break the meringue. I spooned the meringues in mounds on baking sheets lined with parchment paper. I forgot to take a picture before I put them in the oven, so I opened the oven door and took a quick snap. 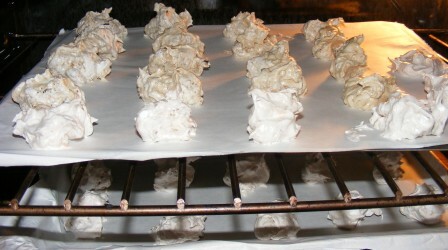 The meringues baked at 300°F for about 30 minutes, until they were fairly dry. This surprised me, as most other recipes I’ve seen call for baking the meringues for 2-3 hours, and some instruct to leave the meringues in the oven overnight to finish drying. 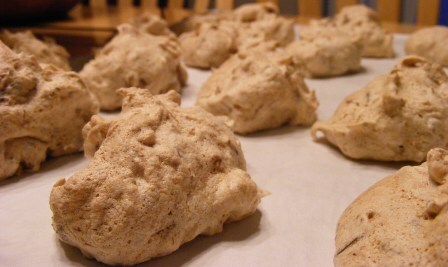 The picture above is of the espresso meringues. The one below shows the cinnamon meringues. The meringues smelled really good baking, and I was anxious to try them to see if they would change my mind. And they almost did. They were both quite flavorful. The cinnamon meringues had a wonderful, spicy aroma. And the chocolate in the espresso meringues made them quite tasty. The only thing I didn’t really care for was the mouth feel after eating a few of them. I didn’t notice it at first, but after a while, my mouth felt really dry, and the meringues left a powdery aftertaste. I think it was from the cornstarch. Eating them with a cup of tea or coffee remedied this for the most part, but I just don’t care for that taste and feeling in my mouth. I have since looked at several other meringue recipes, and none of them seem to call for cornstarch. If I make these again, I’ll try leaving the cornstarch out, as I really did like the flavor of both of them. I think they might need to bake longer without the cornstarch, as I suspect that is what shortens the baking time in this recipe compared to others. It might be worth trying. They were mighty tasty. OK, Nancy, maybe I see the point of sugared air after all. So I was excited to see a new product at the store: Reynolds Wrap Non-stick Pan Lining Paper. It has parchment paper on one side and foil on the other. The theory behind it is this: the foil makes it conform to the pan, while the parchment (which is the side touching the food) keeps things from sticking. And like other pan liners, it keeps the pan clean. I bought a roll and put it to the test over the next several weeks. I began by using it to line a baking dish when making Pecan Spice Bars. I thought the foil would make it press neatly into the pan, but the foil layer is quite thin. I found that it wasn’t much easier to get it to conform to the shape of the pan than plain parchment. And I was disappointed to see that I didn’t get nice, crisp edges and corners, either. 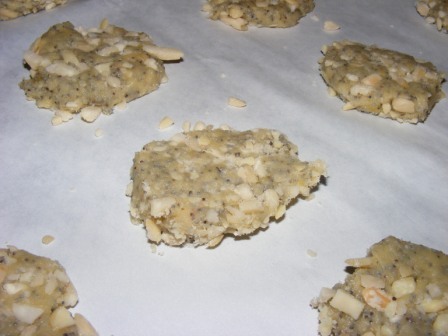 It did make the bars easy to remove from the pan, and the parchment peeled away cleanly from the finished bars. I tried using the parchment foil several more times for similar applications, but it never worked any better than the first time. I found that unless I used a piece larger than the pan and wrapped it around the sides of the pan, the edges curled in. 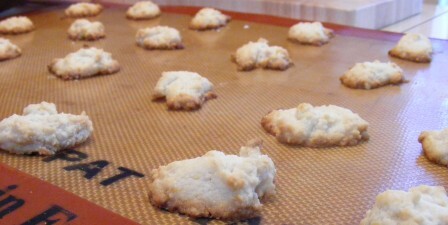 And in some cases, the pan liner actually baked into the cookies. Not what I was anticipating at all. Like parchment, I was able to save the pan lining paper and use it again, although only one more time in most cases. So, overall, I found this product to be a great idea that didn’t perform as I hoped it would. I still have part of the roll left, and I’ll finish using it to line baking pans when I make brownies or bar cookies. But I won’t buy it again. Especially since I can get parchment sheets at a great price at GFS. Now for the parchment trick I alluded to in the first paragraph. This is a tip I picked up from Nick Malgieri, and for my purposes, it makes parchment foil superfluous. 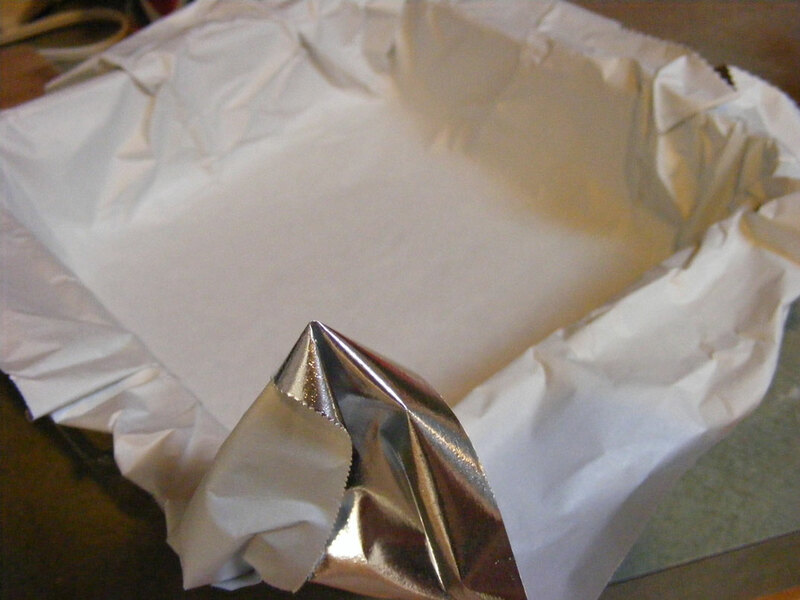 In order to get parchment paper to conform to the shape of a baking dish, turn the dish over and press the parchment around the outside of the pan. The paper will keep the shape of the pan, so all you have to do is turn the pan right side up and drop the parchment into it. So save your money on parchment foil and just keep using parchment paper. It works better, costs less, and with Nick’s shaping trick, is easier to form in the pan, too.